Apparently, Apple has been slowly reducing the number of GPL licensed applications that are bundled with OS X. I’m not surprised by this news, especially considering that FreeBSD is doing the same thing. However, buried in the conversation on Hacker News was an interesting comment, that most, if not all, of the top projects on Github are either BSD or MIT licensed. My curiosity was piqued, and this was too good to pass up. I could not find a license on these three projects, if I missed it, please let me know in the comments. – Thanks! From this view, it is clear that MIT is the dominant license among the most popular projects on Github. MIT is followed, at a distance, by BSD and Apache. The JQuery libraries are available in a dual GPL/MIT license, depending on what the developers needs are. Only the Linux kernel is licensed under pure GPL. It would be easy to assume that this list shows a trend away from the GPL and towards the more open and free MIT/BSD style licenses, however, that logical leap would be foolish considering the projects listed. The impact of the Linux kernel on the computing industry is hard to overestimate. The year of the Linux Desktop may never come, but Linux dominates in the data center, especially in web hosting data centers that many of the smaller projects listed above rely on. 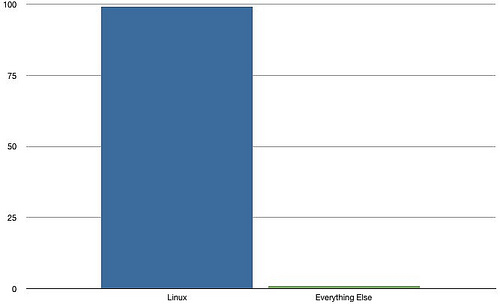 Linux is the foundation that allows most of the other projects to exist. What I am interested in is if the popularity of the BSD and MIT licenses is actually due to the simplicity of the license. They are short, easy to understand, and impose no real restrictions on the use of the code. Has the GPL become too complicated for its own good? I’m looking forward to the conversation. Jesse Babson uses OStatic to support Open Source, ask and answer questions and stay informed. What about you? I think a lot of independent or small-groups of developers are not as interested in the ideology behind GPL and simply don't mind freely sharing their work without limiting it's distribution. Most of the time, if I want to release open source, I don't care for forcing it's potential users to be open themselves. I'd much rather get a larger community around it. 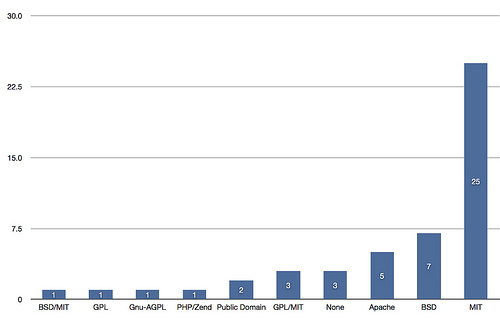 The GitHub list shows that MIT is the dominant license, followed at a distance by BSD and Apache. The J Query libraries are available in a dual GPL/MIT license, Only the Linux kernel is licensed under pure GPL. Not sure but I suspect some true GPL people have mitigated feelings about a closed software based cloud (although g+ is a good place for following a few prominent kernel hackers), and they might be avoiding it. What's perhaps missing, to convince these, is a Pull Request protocol that would work between github-like platforms. The GPL is likely to have saved a lot of code developped at Edenwall from being buried ( http://ufwi.org/ ), and is likely to be a protection against more obscure binary blobs in the Linux kernel, for instance. If you are a member, Sign in to have your comment attributed to you. If you are not yet a member, Join OStatic and help the Open Source community by sharing your thoughts, answering user questions and providing reviews and alternatives for projects. Promote Open Source Knowledge by sharing your thoughts, listing Alternatives and Answering Questions! Browse Get answers and share your expertise. What is the best way to do proxying? Using Apache ProxyPass or another way for it?